In this Photoshop tutorial, we'll look at what's new and improved in the Curves dialog box in Photoshop CS3. The Curves image adjustment has been around in Photoshop since the very beginning and is widely considered to be the most powerful and versatile photo editing tool in the entire program. In a previous tutorial, we looked at the basics of Curves and how it compares with another of Photoshop's most popular image adjustments, the Levels command. While the fundamentals of how Curves works haven't changed in Photoshop CS3, the Curves dialog box itself certainly has. Adobe made major changes to Photoshop's user interface in CS3, and the Curves dialog box received quite a few improvements and additions, including the ability to view the histogram directly inside the Curves grid. In fact, with Photoshop CS3, Curves has become such a complete image editing solution that you may never go back to using Levels again! Be sure to check out our Comparing the Levels and Curves Image Adjustments tutorial if you're completely new to Curves, since in this tutorial, we'll simply be covering what's new with Curves in Photoshop CS3. Let's get started! Only the larger, full size version of the Curves dialog box is available in Photoshop CS3. In Photoshop CS3, we can finally see the histogram directly within the Curves grid! Previously, the histogram was only available in the Levels dialog box or by viewing it in the Histogram palette. The only downside to the histogram in Curves is that like Levels, it shows us only what the image looked like before making any adjustments. To view an updated histogram as you work, you'll still want to keep the Histogram palette open. However, having the histogram displayed in the Curves grid makes it much easier to judge which tonal values need to be adjusted, and makes it almost as easy to set new black and white points for an image as it is in Levels. And when I say almost as easy, wait till you see the next new feature! Both Curves (left) and Levels (right) now display the same image histogram, although it appears taller in Curves due to the square shape of the grid. 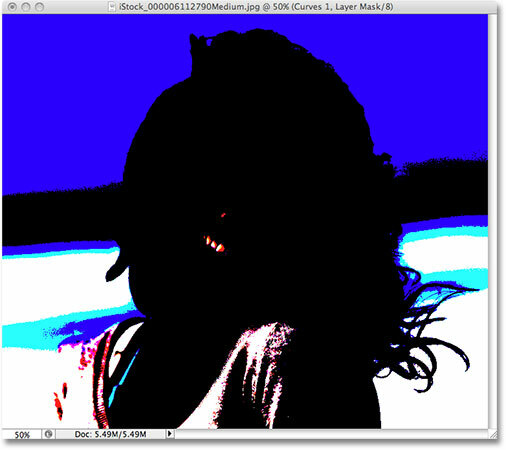 The Black Point and White Point sliders from Levels have been brought over to Curves in Photoshop CS3. Select the new Show Clipping option to view any areas being clipped to pure black or white. Areas appearing in black or in different colors indicate a loss of image detail when dragging the Black Point slider. Areas appearing in white or in different colors indicate a loss of image detail when dragging the White Point slider. Switch between the black and white clipping displays with the Black and White eyedroppers. You can also turn on the clipping display temporarily by simply holding down your Alt (Win) / Option (Mac) key while dragging the Black and White Point sliders. By default, Photoshop displays the Input levels and Output levels gradients in the Curves dialog box from black to white, which makes sense when working with brightness values. Black represents areas of no light, a brightness value of 0, and as we increase the brightness values, we add more and more light until finally reaching white, the maximum amount of light possible, at level 255. For most people, this is the preferred way of working in Curves. If you come from a printing background, though, and you're more comfortable thinking in terms of ink percentages rather than light values, where white represents 0% ink and black is 100% ink, you may prefer to switch the gradients around so that they go from white-to-black rather than black-to-white. The Light / Ink options switch the gradients between black-to-white and white-to-black. Photoshop CS3 now gives us easy icons for switching between the 4x4 and 10x10 grid sizes in Curves. It's now possible to view the individual color channel curves while the composite channel is selected. Unfortunately, we can't select any of the individual color channels in the overlay. We still need to select a color channel from the Channel option to make any changes to it. The histogram can be turned on or off in the Curves grid with the Histogram option at the bottom of the dialog box. The Baseline is the light gray diagonal line showing the initial starting point before any adjustments were made to the curve. Intersecting horizontal and vertical lines appear at the point when moving it to help judge the "before and after" brightness values. Choose from any of the preset curves available from the Preset drop-down list at the top of the dialog box. 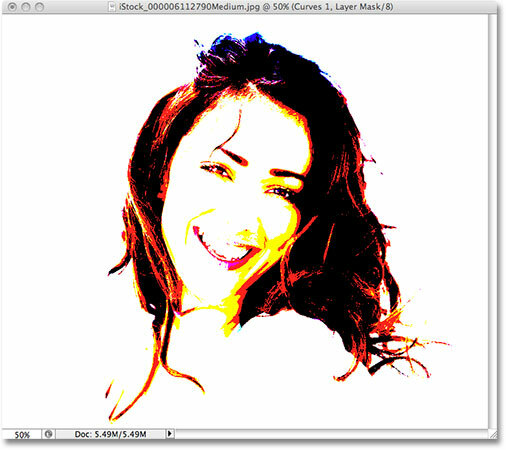 Curves can now easily be saved as custom presets when you need to apply them to several images. Custom curves will appear with the other preset curves in the Preset list. If you chose to save your curve somewhere else, you'll need to click back on the icon to the right of the list of presets and choose Load Preset, then navigate to the where you saved the curve to access it. And there we have it! That's our look at what's new and improved inside the Curves dialog box in Photoshop CS3! Check out our Photo Retouching section for more Photoshop image editing tutorials!